More people than ever are getting dental implants to replace missing teeth. Dental implants are a long-lasting solution to support a crown, bridge, or denture. They are embedded in your jawbone and mimic the function of a natural tooth’s roots, preserving the bone and preventing the neighboring teeth from sliding out of position. Dental implants are small titanium devices that are placed in the jawbone where teeth have been removed. They fuse with the bone and function as artificial tooth roots to replace single teeth or to support a bridge or denture when multiple teeth are missing. When do I need a dental implant as opposed to a crown? If a tooth has been damaged, you may need a crown to cover the tooth and restore it to its normal shape and size. 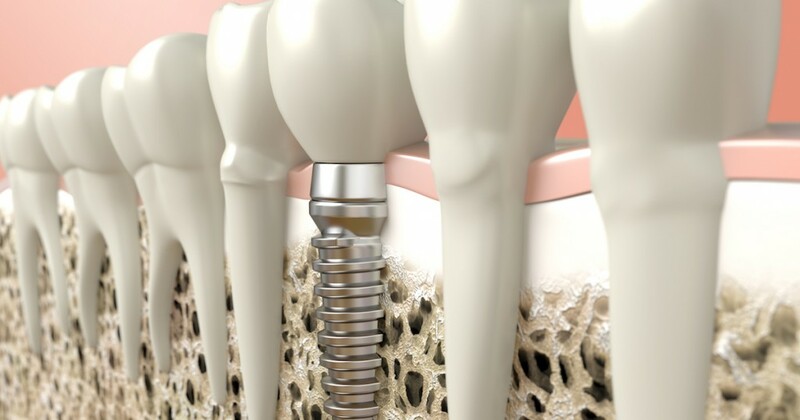 Dental implants replace teeth that are completely missing. What are the benefits of dental implants versus dentures or bridges? Dental implants, a dental bridge, or a partial denture can all replace one or more missing teeth. But only the dental implant mimics the tooth roots, anchoring the artificial tooth in the jaw to prevent bone loss. The dental implant is then capped with a crown that looks just like your natural teeth. Dental implants do not require any changes to healthy teeth in your mouth. Best of all, dental implants can last a lifetime. A dental bridge, on the other hand, requires the dentist to file down the healthy teeth on either side of the missing tooth or teeth. Those filed-down teeth act as anchors for the bridge; they are capped by crowns that are then attached to the artificial teeth of the bridge that will rest on top of the gum line. Since the artificial teeth aren’t connected to the jaw bone, the bone will recede over time, and the gum line will sink. Dental bridges typically need to be replaced every five to 10 years. A traditional denture is a series of artificial teeth that sit on top of the gums. They are held in place by the mouth’s natural suctioning ability and by denture paste. They can slip and slide, and as the bone beneath the denture begins to recede, the gum line changes and the denture will need to be relined or replaced. A denture or a bridge can be secured by dental implants, which will preserve the shape of the jawbone and provide a stable base for the artificial teeth. What is the All-on-4® dental implant procedure? All-on-4® dental implants have helped hundreds of thousands of people enjoy the security of having a denture that will stay in place. 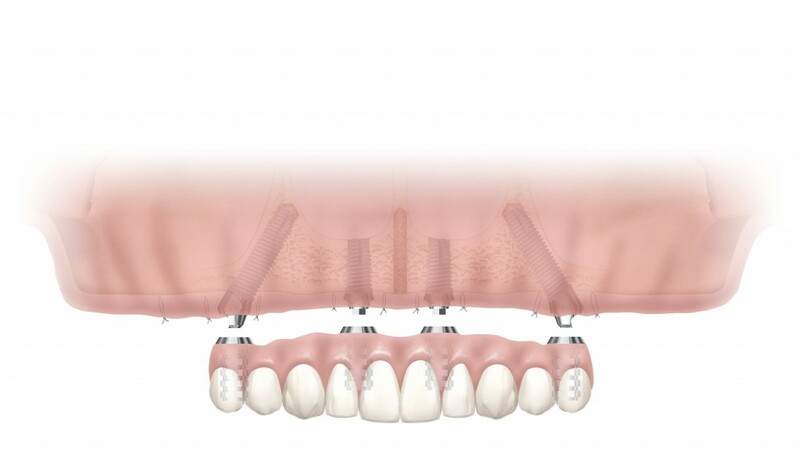 First created in 1998, the All-on-4 implant system uses two dental implants in front and two tilted implants in the back of the mouth to anchor a complete denture. What is the Virtually Yours: Implants in a Day™ procedure? In this innovative approach, the time required for the dental implant process is greatly reduced. It begins with an initial examination in which we make a model or digital image of your mouth. At your next appointment, we place the implant or implants. Your dentist then places the new crown or denture. Best of all, you can eat soon after the treatment. How long does the traditional implant procedure take? The traditional dental implant process can take several months. The first step is a thorough evaluation, which may include several x-rays and other diagnostic tests such as a CT scan, which call all be done in the comfort of our office. Next, our dental implant surgeon will place the dental implant. The next phase involves osseointegration, which is the fusing of the titanium implant post with the surrounding bone tissue. This process can take two to seven months. When the dental implant has fused with the bone and the gum tissue has healed, you’re ready to visit the restorative dentist who will create the artificial tooth or teeth to attach to the dental implant. Which of your locations offer dental implant services? Dental implants are offered at all three of our offices: Annandale, Manassas, and Woodbridge. Our expert, knowledgeable, and friendly oral surgeons can walk you through the procedure and answer any questions or concerns you may have.